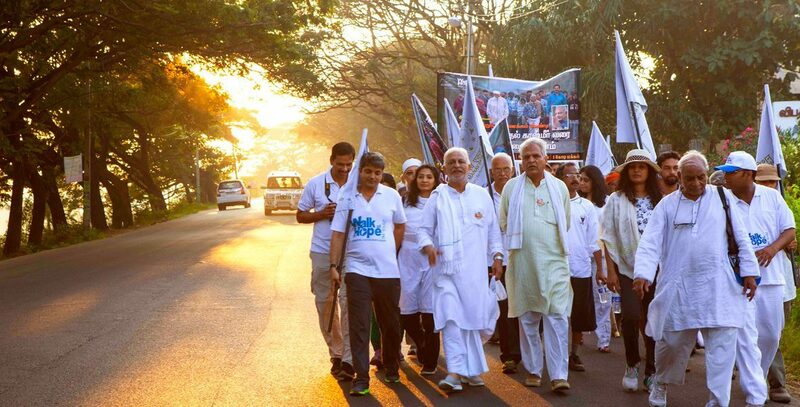 Walk of Hope was a padayatra for peace and harmony by the Manav Ekta Mission – which covered 7500 kms from Kanyakumari to Kashmir. Led by Sri M, founder of Manav Ekta Mission, the journey spanned 16 months through 11 Indian states, bringing together citizens from all walks of life. Traversing the varied landscape of India, it sought a significantly restored nation—fit enough to be bequeathed to our future generations. The Walk of Hope was ﬂagged off on 12 January 2015, the birth anniversary of a great prophet of interfaith harmony, Swami Vivekananda. Starting from the Gandhi Memorial Mandapam in Kanyakumari, it concluded in Srinagar, Jammu & Kashmir on 29 April 2016, reaching out to 10 million fellow Indians during the Walk. The padayatra covered 15-20 kms a day and halted in the evening at a pre-determined village or town enroute. The evening was spent meeting with the local populace – which usually included meaningful dialogues, inter-faith prayers, eating together and, ﬁnally, resting overnight at their homes. A diverse assembly of responsible citizens, who foresaw a united and inclusive India for themselves and the future generations, accompanied Sri M in this walk. The Walk of Hope was an exercise to restore the innate spirituality of the nation – rekindling true faith and rejuvenating the spirit of hope, love, peace, harmony and oneness. The hope was and still is to erase disparities arising from a misunderstanding of our diverse culture and religions, thus uniting the humanity of India through a spiritual approach proving people can live together despite all differences.